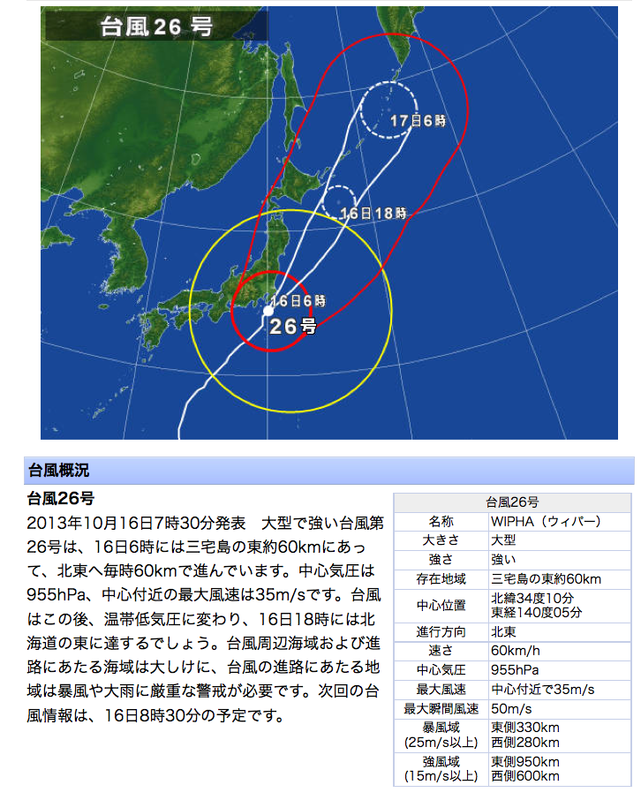 Jeffrey Friedl's Blog » Worst Typhoon Since Godzilla About To Strike Into The Heart of Tokyo!! Worst Typhoon Since Godzilla About To Strike Into The Heart of Tokyo!! Sensationalist headlines are always a problem in American media, but now I'm seeing it in Japan as well. As I write this, Kyoto has partly cloudy skies and chirping birds, but Tokyo 400km to my east is getting absolutely shellacked by powerful Typhoon #26 of the season. The maximum wind of 50 m/s (112mph) is powerful, but doesn't seem to be the most powerful I've seen even recently, much less in all the last 10 years, so the headline perplexed me. Going back to the article, the first line of prose gives the answer: “The strongest typhoon to reach Tokyo in 10 years...”. Ah, I see. Someone apparently decided that an honest headline wasn't attention-grabbing enough. Sigh. Incidentally, Typhoon #18 that caused flooding in Kyoto (among much else) a month ago was much weaker wind-wise, but for whatever reason was amazing water-wise, producing “once in a generation” rain over wide areas. The noise of the rain hitting the windows plus the banging of my front door being repeatedly sucked by the wind made for a very short night. But there doesn’t seem to be much damage around where I live (Tsukuba). Cycling to work this morning is going to be fun! Sorry to here Tokyo is being hit with a Typhoon. And of flooding in Kyoto. I live in Washington, DC and, in the last few days, have heard news of nothing other than the catastrophe being brewed up by the US Congress. It is good to be reminded that there is a world with real people facing real problems out there. But then, my next thought is that, if the US defaults on its debt, my country will again be responsible for adding to the economic woes of so many innocent people around the world. It’s all very frustrating; and about the only reasonable response is to go to Lightroom, install the plug-ins that brought me to your blog, and do my best to get absorbed in photos. Meanwhile, I hope that this typhoon doesn’t bring too much rain to Kyoto. (I’m not sure how Typhoons work, but in the US hurricanes move up the East coast and can bring a lot of rain, even when they’ve been downgraded. My daughter was thinking of building an ark last week, because we were getting aftereffects of some storm with rain for days. Hurricanes are a bit scary to me now, as it’s fast coming up on Hurricane Sandy’s 1 year anniversary. I’m from New York City and we got hit pretty hard. I personally know a few friends who had their basements flooded. so I follow your blog because I like the Lightroom plugins – ok, wrong url subscribed, but anyway – talking about the weather is nice as well. When it comes to Hurricanes and derivates, I’d say that the windspeed is an interesting but not neccessarely the most important indicator of the storm during landfall. I really look at precipitation as primary danger, because it can cause flooding with all its decendans such as tipping houses, mudstreams, power disruptions etc. It seems there’s quite a bit of action around Japan coming week.